Nov. 24, 2017, 11:58 a.m.
Who could headline Hangout 2018? Lineup Rumors & Predictions! The Hangout 2018 lineup is here, and with it the beginning of festival lineup season. The Hangout lineup is typically the first lineup announced each year, and often gives some insights to who will be on the festival circuit in 2018. Specifically, Hangout is run by Goldenvoice, the same organization that brings you Coachella, Firefly and other big festivals. Generally there is quite a bit of crossover, so even if you aren't going to Hangout it's interesting to see who is on the billing. Here's our review of the Hangout Festival 2018 lineup. 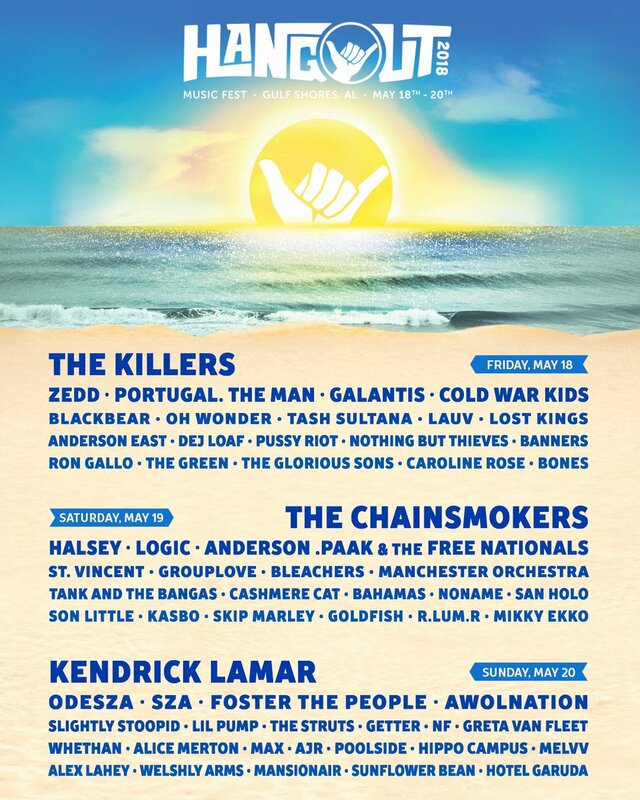 Hangout has solid headliners, but nothing amazing. King Kendrick is always a pleasure to see at the top of a billing, so that is always a nice get. The other two leave something to be desired. 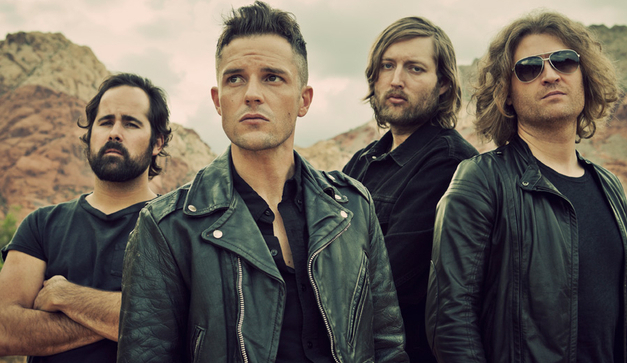 Don't get me wrong, I still like The Killers, much more than anyone else I know, but there's nothing inspiring about seeing them on top of the lineup. They will play the hits, it will be fun, but it's also something we've seen before. As for the Chainsmokers....ugh. It's a day I've been dreading for awhile: when we begin to see The Chainsmokers as headliners of festivals. They're fine, there's nothing wrong with them, but theirs nothing special about them either. They're standard Pop Top 40, so if that's the type of uninspiring music that gets you excited then Hangout is for you. I'm surprisingly rather fond of Hangout's 2nd and 3rd liners. St. Vincent, Odesza, Anderson Paak, Portugal The Man and and Galantis is enough to get me excited about Hangout in the early evenings. There's a lot of nice gets of people coming off of new albums, and there is a good mix with something for everyone. Not only that, but a lot of these acts are particularly good live. The headliners won't be making me purchase a Hangout ticket in 2018, but the 2nd and 3rd liners are the main draw for me. There's some sneaky good acts here, many of which I am guessing a lot of people haven't heard of. Personally my favorites are Goldfish, Hippo Campus and and Ron Gallo. If you want the full breakdown of who we like on the lower lines keep reading. Generally my favorite time at Hangout is early in the day when it isn't super busy, and you can just chill out in the sand. It's a pretty basic lineup. There's nothing amazing about it, and certainly not one I think will is a high sell out risk. Kendrick is a great get, but even he has been touring now for over a year. The other headliners are pretty boring as it a lot of the rest of the lineup (Foster The People, AWOL, Cold War Kids, etc). If Hangout is a sign of what's to come in the 2018 festival season I have to admit I am not too excited. My personal favorite part with festivals is diving into the lower lines of a festival lineup and discovering great artists that are playing early in the day. Often with these shows you can get right to the front and discover some great talent that in a few years will be much higher on the festival poster. These are our favorite lower level acts (line 4 or 5) at Hangout 2018. Just fun, upbeat music for early in the day. This show will be full of good vibes and early dancing on the sand. If you just want to have fun for an hour check out Goldfish. Really fun live, jam band. If you want easy going indie rock from chill guys who enjoy playing in their pajamas give Hippo Campus a try. I've seen them live several times and they are always fun. I totally expect them to rise up to the 2nd or 3rd line at festivals in years to come. If you want to rock out then don't miss this show. Nothing But Thieves is probably my favorite rock band (granted there is a lack of them on Hangout's lineup this year) on the billing. If you like bands like Royal Blood, Arctic Monkeys or other good old fashioned rock and roll then this is the show for you.